FIU researchers are using technology and principles derived from the traditional Japanese art of origami to create remarkably compact and incredibly efficient antennas and electronics. Georgakopoulos is working with colleagues at Georgia Tech with the support of a $2 million grant from the National Science Foundation. The team will work on the development of unique shapes that can allow the antennas to be only a couple of centimeters when folded flat and expand into much larger spaces with powerful, ultra-broadband capabilities. 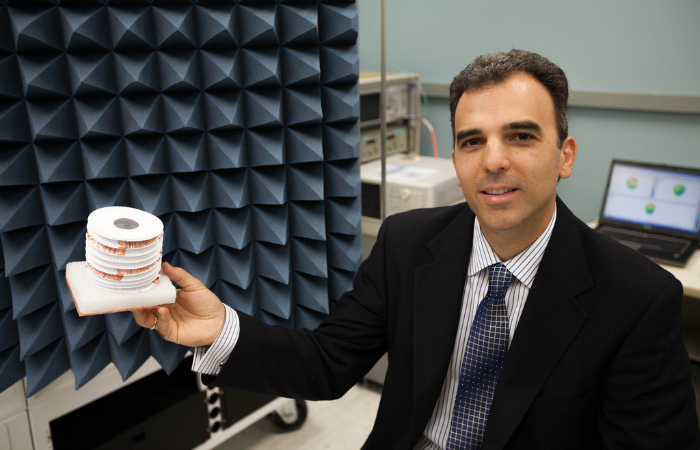 Stavros V. Georgakopoulos, assistant professor at FIU’s Department of Electrical and Computer Engineering, holding an origami antenna. “A soldier will be able to carry a powerful antenna into combat folded in his back pocket,” said Georgakopoulos. Possible applications for the antennas include a range of military and commercial uses, including communications equipment, wireless sensors, health monitoring sensors, portable medical equipment, and many other applications. A traditional paper-folding art, origami includes both modular and moving types of structures. Mathematicians recently have focused on theoretical and practical questions raised by origami, resulting in technical advances in many areas. Origami structures can be fabricated from a wide variety of materials. While Georgakopoulos mainly uses paper, he is also exploring plastics and flexible dielectrics. The researchers use sophisticated inkjet printing techniques to deposit conductive materials such as copper or silver onto paper in order to create antenna elements with novel signal reception and other capabilities.